After the previous episode’s meeting of Old and New Gods, things are heating up this week, and yes that is an intentional Vulcan-based pun. You can’t blame me for punnery. The episode title does it too, as “A Murder of Gods” is not only referencing the Mad Sweeney-approved collective noun for gods, but also the fact that gods are getting murdered this week. Or, more accurately, sacrificed. 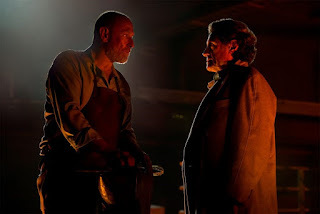 Sacrifice is a theme throughout the episode, perhaps more so than American Gods’ usual theme of belief. Sacrifice of self, sacrifice of others, emotional sacrifice, ritualistic sacrifice, and the sacrifice of the past to provide a new future — it all plays a part. In the dead of night, a group of people hope to enter America from Mexico via a section of the Rio Grande. They cross themselves and pray, then their guide warns that anyone unable to swim should stay behind. One man does, separating from his family, but as the rest of the group begins to swim across, the man’s caution is undone and he enters the water — a mistake, as he is eventually overwhelmed and falls beneath the surface. A hand reaches out and pulls the man to safety as prayers of thanks are given by those already on American soil. When asked for his name, the rescuer tells the man, “You already know my name.” A halo of light appears around his head, but it’s not just a hint at holiness — it’s the light cast by several trucks of armed men patrolling the river. Generally, these Coming to America vignettes represent how gods traveled to America in the past and, whether it’s 14,000 B.C. or 1697, they’re always a window into the history of American faiths. This story is not only different in its modernity, but also in its representation. Christianity — the faith of those crossing — already exists in America, as we see glimpses of the border patrol’s faith in the words etched on the barrels of their guns (“Thy Kingdom Come”) and a rosary, wrapped around a hand that reloads, fires, and kills those on the riverbank. The list of their victims includes the Mexican manifestation of Jesus, who tries to stop the violence but is shot along with the others. Actually, I say “the others,” but we don’t see what happens to the man saved from the river, or his family. I suppose it’s possible that Jesus’s sacrifice — complete with the Christian/Catholic symbolism of a mimicked crucifixion, a tumbleweed that sheds a crown of thorns, and a chest wound that glows and bleeds into the shape of the Sacred Heart — gave the man and his family a chance to escape. I’d certainly like to believe so. Shadow and Wednesday are running from the New Gods they met in the previous episode. Still reeling from his encounter with Media as a floating Marilyn Monroe and his brush with an angry tree at the police station, Shadow is back to having trouble with the weird stuff going on in his life. It’s a real pity, too, because he was making so much progress! Maybe if things had continued to come to him more slowly, Shadow wouldn’t have been so derailed — but rather than just glimpsing through the peripheral window of the world’s strangeness (to paraphrase Wednesday), the last couple hours have like, shoved Shadow’s head through that window and now he’s freaking out again. Also, he’s bleeding a lot from that tree wound. Blood loss doesn’t help one cope with severe disruptions in reality. Wednesday is quite interested to learn that Shadow received a visit from his dead ex-wife and they go back to the Starbrite Motel to see if Laura’s still there. They find the aftermath of the fight between Laura and Mad Sweeney, but no Laura. The only thing Wednesday says about it is that Laura must have a purpose (and a temper), and that purpose was to “let [Shadow] go.” So, they go. It turns out that Shadow’s tree wound is more than just a tree wound — it’s the “infection” of a semi-sentient cluster of roots inside that wound. It was given to him by Mr. Wood, a god who started as a manifestation of early man’s worship of trees but sacrificed himself to the encroachment of industrialization in his forested domain. Significantly, Mr. Wood shifted his method of receiving worship into something new and thus changed himself from an Old God to a New God to stay relevant, which is the offer that Wednesday rejected in the previous episode. Wednesday rips the root from Shadow and tosses it on the ground. With Shadow’s gross root-wound hopefully dealt with, the two of them drive to Vulcan, Virginia to meet with an old friend: Vulcan himself. Much like Mr. Wood, Vulcan has adapted to a more modern age. Instead of being a god of the forge, he’s the god of a factory making bullets. Instead of being a god of volcano fire, he’s the god of firearms. Instead of throwing sacrifices into a volcano, he allows the occasional worker to fall into a vat of molten metal and be made into bullets. Vulcan’s not much on OSHA guidelines, apparently. And yes, the bullets made in Vulcan, VA are indeed the same ones used by the armed border patrol in the opening sequence. The meeting between Vulcan and Wednesday seems amiable at first. Wednesday brings him soma and asks him how he got such a sweet gig as the god of a whole town (“Sacrifice,” says Vulcan). They share a drink without drinking while Vulcan creepily creeps out Shadow and the audience with references to hanging trees, the franchising of faith, and how safe the bullets he prints with his name make his “believers” feel. Things turn sour after Wednesday gets Vulcan’s agreement to join the fray and forge Wednesday a sword. As Vulcan is putting the final touches on the sword in the bullet factory, he reveals that he’s switched sides. Like Mr. Wood before him, Vulcan has bought into the New Gods’ sales pitch and won’t be fighting alongside Wednesday when the battle comes. Unfortunately for Vulcan, Wednesday has already received his verbal alliance and his sword — which means that, when Wednesday cuts off Vulcan’s head and throws him into the same vat of molten metal his sacrifices fall into, he can spin the death into a martyrdom and blame it on the New Gods. Also, Wednesday pees into the molten metal to “curse” it, and I have no idea what it’s going to mean for the bullets made from that metal but it’ll probably mean something. Back at the beginning of the episode, Laura also returns to the Starbrite Motel, but she’s too late to talk to Shadow. She’s also too late to get into her car and follow him, since her car was towed by the police (it was, after all, the car of a murder victim and the police had no reason to believe she’d be needing it again). That last bit of news is delivered by Mad Sweeney, who still wants his coin back and has arrived at the conclusion that the only way to get what he wants is to make it so Laura no longer needs the coin. After name-dropping Jesus, Mad Sweeney tells Laura he knows a guy who does resurrections. He’ll get Laura resurrected, she won’t need the coin to keep moving around, she’ll cough it up, and he’ll be on his merry leprechaun way. As far as American Gods plans go, it’s straightforward. Our favorite supernatural jerks decide to steal a car to get them where they need to go, but end up stealing the cab of Salim (you may remember him from “Head Full of Snow”). He is very much not a supernatural jerk and is probably too nice to be hanging out with Laura and Sweeney. Still, Salim thinks the dead woman and the leprechaun might help him find the jinn he’s looking for, so he offers to drive them where they need to go. I don’t know if it’s friendship exactly, since Laura still seems unlikely to make friends, but Laura and Salim develop a sort of comradery that I greatly enjoy throughout their storyline. They seem to pair off against the ruder Mad Sweeney as two people sharing in the sacrificial shedding of their past lives and welcoming a new life on the horizon. Salim is a man of faith while Laura remains faithless and untethered to anything or anyone who isn’t Shadow, but there seems to be a genuine connection between the two of them. Salim sympathizes with Laura and engages her in conversation about family, prayer, and faith. Laura takes Salim’s earnestness to heart and directs his cab to Indiana instead of Kentucky, where Sweeney told them to go. We see — through Shadow’s mind in a pseudo-hypnotism sequence initiated by Wednesday — Laura visit her family’s house and peer inside through the window. As Wednesday described the existence of Old and New Gods as something on the periphery, viewable through metaphorical windows should one only look, Laura is looking through a window from her place in that otherworldly, peripheral space, into a normalcy in which she no longer exists. She shrugs off the idea of never seeing her family again, but if she isn’t affected by the sacrifices she’s making for a second chance at a new life, there was no reason for her to divert the car to Indiana in the first place. At the end of the episode, Salim participates in morning prayer as the sun rises and Mad Sweeney and Laura watch. After prayer, Salim turns to Laura and, if they agree on nothing else, at least they agree that “Life is good.” Living is good. New lives are good, whatever the sacrifice. Poor, poor Salim does not deserve to be trapped on a road trip with Mad Sweeney. Cleverly, the show has Corbin Bernsen play Vulcan with a limp — in mythology, Vulcan was thrown from the heavens and broke his leg when he landed. I do love the music choice of “I Put a Spell on You” on top of the gun-fanatic town of Vulcan. “Neutral in the face of injustice is on the side of the oppressor.” Wednesday Wisdom indeed. I know I say it a lot, but just... Ricky Whittle is the absolute best. His reaction after Wednesday cuts off Vulcan’s head is magnificent.